Welcome to Art Seen, The Independent‘s new biweekly visual art column. Read on for what’s happening around town, from current exhibitions to art events, gallery news, and more. WANDERLUST: If the dog days of summer have you dreaming of visits to faraway lands, save yourself the airfare and head over to the Santa Barbara Museum of Art (1130 State St.) between now and December 13. There you’ll find Noble Tombs at Mawangdui, an exhibit of ancient Chinese art and artifacts on view in the United States for the first time. The collection includes paintings, lacquerware, silk robes, and bronze sculptures and dates from the third century BCE. These treasures represent one of the major archaeological finds of the 20th century. Rembrandt van Rijn's "Beggar Seated on a Bank" (1630). Just down the road, in Montecito, you’ll be transported to other worlds. At Westmont College’s Reynolds Gallery (955 La Paz Rd. 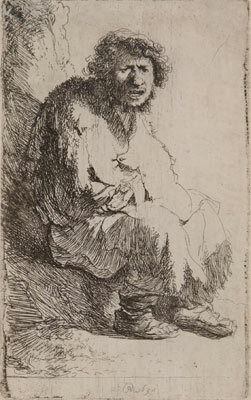 ), 36 etchings by the Dutch master Rembrandt van Rijn are on display through October 31. These prints focus on beggars-a common subject that informed his paintings of saints as well as many of his self-portraits. Also on display in the gallery are photographs by South African artist Zwelethu Mthethwa, whose images offer a modern picture of poverty. This exhibition is one more feather in the cap of the gallery’s new director Judy Larson: Last month she secured a significant federal grant for Reynolds, and she’s preparing for a move into a brand new campus arts center in 2011. Nowhere is the wandering spirit given a more intriguing treatment than in Richard Aber’s Nomadic Sculpture series, on display at The Arts Fund (205C Santa Barbara St.) through October 23. Aber’s giant, tent-like structures are at once ancient-their paneled exteriors reminiscent of scales-and futuristic, calling to mind the stark monumentality of alien spacecraft. STRENGTH IN NUMBERS: Fans of Aber will also find his work at Channing Peake Gallery (105 E. Anapamu St.), alongside work by more than 30 other visual artists. The exhibition runs through January 22, 2010, and celebrates 20 years of Individual Artist Award winners. Among the many works on display is Linda Ekstrom’s beautiful and mysterious “Complete Works,” a silk bag filled with shredded newsprint and dotted with circular panels depicting birds in flight. Other group shows to catch include the annual Small Images Competition at SBCC’s Atkinson Gallery (721 Cliff Dr.) through October 30, where you’ll find such tiny treasures as Larry Mills’s “Praise the Lord!” in which a bust of Christ is surrounded by beer bottles. Over at the central library’s Faulkner Gallery (40 E. Anapamu St.), the Santa Barbara Printmakers group show runs through October 31 and features etchings, monotypes, woodblock prints, linocuts, and more. And photo buffs take note: On Tuesday, October 20, at 7:30 p.m., the Channel City Camera Club hosts a free slideshow of winning entries to the prestigious London Salon of Photography. The images come from 25 countries around the world and will be displayed at the Santa Barbara Museum of Natural History’s Farrand Hall (2559 Puesta del Sol Rd.). Finally, swing by the Funk Zone for some fresh seafood and check out Fishnet (46 Helena Ave.), a new retail space and gallery where you’ll find not only fabulous lace corsets, spray-painted lunchboxes, and original jewelry, but also Jessica Nye’s moody, black-and-white photographs of the female form and David Cooley’s pop art-inspired “Feed Me,” in which bird nest-speckled wallpaper has been overlaid with pixels of neon paint. DON’T MISS THIS: Tonight, October 8, 7-9 p.m., stop by the Cabrillo Arts Pavilion, where nonprofit Health Care for All-California is holding an art-inspired fundraiser, Outside the Box. Among the one-of-a-kind pieces being auctioned off is a purse-box made by The Indy‘s own Starshine Roshell (hint: it’s the one with fake leopard fur and sparkly pink bling). And this weekend, October 10 and 11, hop in the car and head out to Ojai, where the Ojai Studio Artists Tour runs from 10 a.m. to 5 p.m. both days. Among the featured studios is that of recently deceased, luminary arts-and-crafts potter Otto Heino, whose work will be for sale.